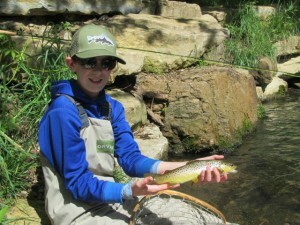 Fox and his father, Mike, are long time clients of Rouse’s Fly Fishing and we were fortunate last week that Jamie Rouse asked us to help out and do a guide trip for Mike and Fox who is thirteen years old. Fox has done quite a bit of fly fishing and is well on his way to being a top notch fly fisher. We decided to spend the morning on Dry Run Creek where fly fishing is limited to handicapped anglers and those others under sixteen years of age. It is a true gem in our wonderful state of Arkansas and it is slam full of Brown, Rainbow, Cutthroat and Brook trout. It is a small creek with lots of low overhanging vegetation but Fox proved very capable of roll casting so it was not long before he was hooked up to a nice rainbow. 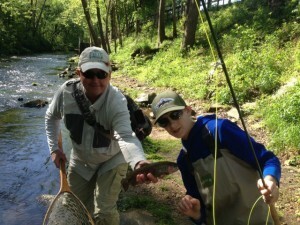 His best fish of the morning was a beautiful 16″ Brown trout. After a big picnic lunch in the park we put the jet boat in on the Norfork River for the rest of the afternoon. The wind really came up in the afternoon and blew 25-30mph with gusts to 40mph so getting a good drag free drift and just making a cast was difficult not to mention trying to row a jet boat. Regardless Fox managed to bring several nice rainbows to the net. Bo always enjoys these father-son trips and it was also very nice not to see a cell phone all day! 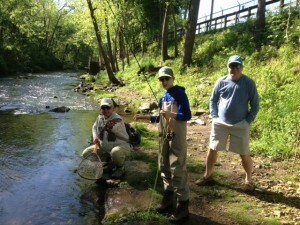 All in all it was an enjoyable day of fly fishing and again our thanks to Rouse Fly Fishing for letting us help out. We hope to see Fox and his Dad again.